Rachelle Heger is a LA based voice actress who has been a part of various video games, anime, and animated series. 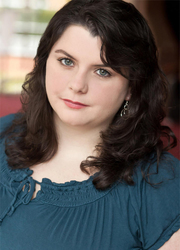 Born and raised in Massachusetts, Rachelle moved to the west coast to pursue voice over. Rachelle is most well known for her work as "Sucy" in Little Witch Academia and Little Witch Academia 2: The Enchanted Parade. Other roles include "Mittens" in Lala Loopsy Girls, "Olivia" in Lego Friends, "Truffles" in Disney Palace Pets, "Pearl" in the upcoming game Undead Darlings, "Gundromeda" in Heroes of Newerth, and various voices in Persona 5. Rachelle has also provided additional voices for RuneStory, Persona 4: The Animation, and Kill la Kill. In addition to voice acting, Rachelle is also a singer, and a part of re:TYE on YouTube who sing English covers of anime songs. As well as working in the anime industry, Rachelle has been a long time fan of anime and video games, and loves to keep up to date on the newest titles.